t the Pennsic War event this year, I taught a suite of four classes treating the use of the German longsword, dagger, sword and buckler, and, finally – messer. 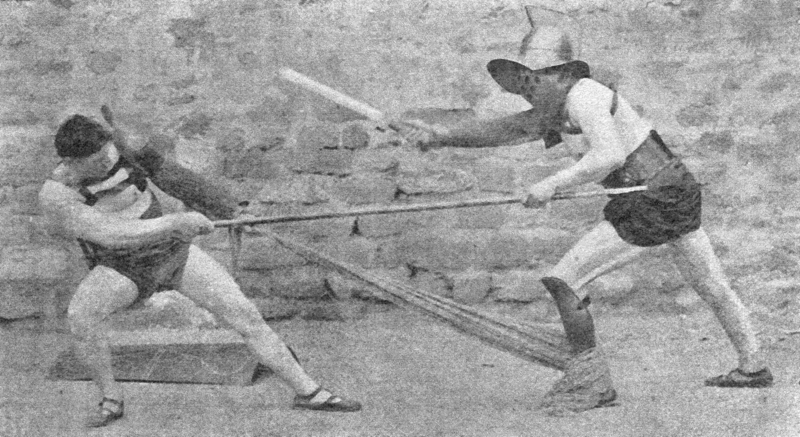 During that final class, someone asked me why the cleric/fencing author Johannes Lecküchner, in his mammoth treatise on the messer, had at once repeated so much of his predecessor Liechtenauer’s verse for the longsword, but had changed the names of most of the signature strokes with the sword, and for all of the guards. “Perhaps he [Lecküchner] wanted it clear that the techniques varied a bit when performed with the messer and so named them differently”, I answered with little conviction. I’ve given that stock answer for several years now, with progressively less confidence each time. 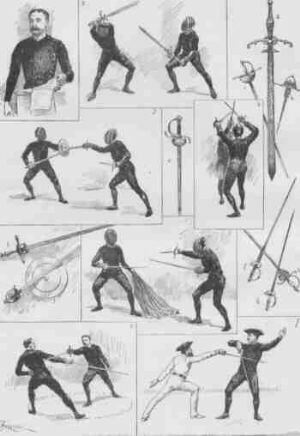 After all, there’s a major flaw with that reasoning: the messer version of the Zornhau (Wrath Stroke) is done a bit differently than its longsword analog, and yet Lecküchner retained that particular name. 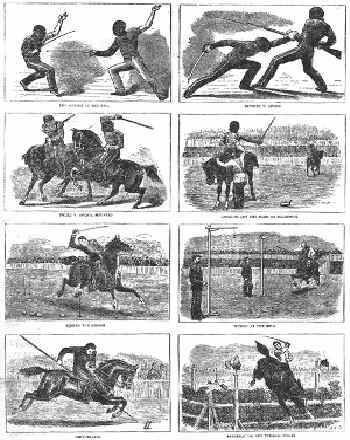 It was during the drive home from the event that it struck me: Lecküchner’s names are “toughened up” versions of the old names for the strokes and guards of the longsword; his sound more aggressive, geared more toward war and the hunt, rather than agriculture. The Krumphau, or Crooked Stroke, becomes the Weckerhau – the Awakening Stroke. 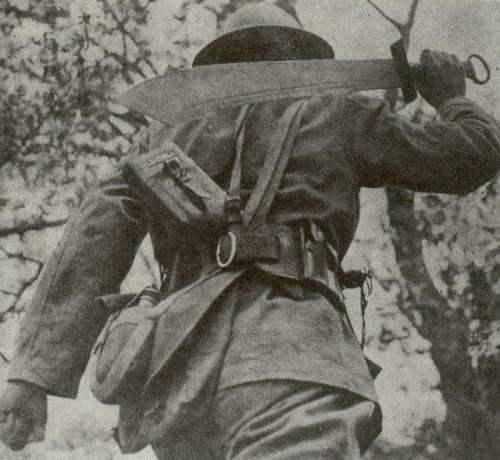 The Zwerchhau, or Thwart Stroke, becomes the Entrüsthau – the Disarming Stroke. The Schielhau, or Squinting Stroke, becomes the Zwingerhau – the Constraining Stroke. The Scheitelhau, or Scalp Stroke, becomes the Geferhau – the Endangering Stroke. Each of these new names sounds more aggressive than the longsword antecedent. All this focus on surprise, restraint, and danger is tough talk to be sure! With the four primary guards, the effect of the change is even more profound. 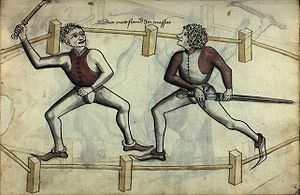 The two “closed wards” for the longsword, Ochs (Ox) and Pflug (Plow), are stripped of their bucolic tranquility and in the messer become , respectively, Stier (Bull or Steer) and Eber (Boar) – clearly, far more brawny names. The open wards – Vom Tag (From the Roof, or From the Day, depending on your interpretation…), and Alber (Fool), are similarly toughened up. The former becomes Luginslant (Watchtower), while the latter becomes Pastei (Bastion). If the agrarian names for the closed wards have been changed to please the bull fighter or huntsman, here the appeal must be to military sensibilities, in both vigilance and stout defense. It is impossible for us to know the mind of Johannes Lecküchner in full, but seen through this lens, it seems he altered Liechtenauer’s language to project a more muscular sense of the art – a valuable distinction when attracting noble eyes. arlier, we brought your attention to a number of unique, European arms and armour titles that have been largely unknown in the USA and are now being distributed by our friends and Peregrinus Publishing. Here is another interesting development in the sword arts community that Freelance Academy Press readers should find of interest: Katsujinken Magazine, A Sword Arts Journal. It has been a hard two decades for magazines, as consolidation, reduction in newstand space and an increasing emphasis on digital newsources – from online editions to blogs – have led to a dramatic reduction in the number of titles, and building enough circulation to survive. In an era where the venerable Newsweek could no longer find enough readers to maintain a print edition and even fanzines have been forced to become all but entirely digital, the Katsujinken team has had a bold ambition: a glossy, full-color, lavishly illustrated journal dedicated to the sword arts. Now entering its second volume, Katsujinken has been both visually and conceptually exquisite, covering Japanese, Chinese, European and Persian martial traditions. Rather than tell you more about it ourselves, we thought we’d let the magazine’s editor and owner, Jason Lee Hatcher explain where this idea came from, and what he hopes to achieve. Q: Can you tell us a little about Katsujinken? How did the idea come about? What is the scope of the magazine? Our official title is, Katsujinken Magazine, a Sword Arts Journal. The word Katsujinken is Japanese for ‘life giving’ or ‘life sustaining’ sword. Much of this ideal was explained in Volume One, the premiere launch issue of our publication. You can understand Katsujinken in this sample scenario: an individual has to draw his sword in defense of an innocent person under attack. He or she isn’t be using the weapon with ill intent, rather to protect and sustain the life of the innocent. This is one thought and it can delve much deeper. Personally, for me, the reason for choosing this name for this magazine has to do with the entire concept of training with edged weaponry and all related facets it brings forth in the lives of each of us individually. 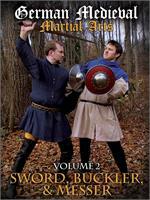 As practitioners, we are all sustained in some way by the sword and edged weaponry arts. This is where we bond with friends and build life long connections, test the limits of of our training, and attempt to create a goodness with-in our communities. It is also where we find such great solace and return so very often, all the while we continue to replenish life in arts that date back hundreds of years. This is yin and yang. Keep in mind, most people outside of our personal sword circles have no idea of what is going on in regards to sword arts. It’s the weirdest thing to tell someone, “I train in the sword arts.” It’s like there are no exact words to express practicing sword arts. Everyone responds with a puzzled look, unless they have an existing interest or former history with sword art training. Katsujinken Magazine is here to bridge these gaps. Not only these gaps, but those that exist between all of us as practitioners. We all have had things we’ve wanted to share with one another, whether it be poetry, stories, gatherings, tutorials, competition results, upcoming events, training halls, articles on lessons learned, the latest arms or newest products on the market etc. Katsujinken Magazine provides us with a reoccurring canvas, which transforms all of this information into a tangible masterpiece for reader entertainment every four months. Q: You’ve produced a really, visually beautiful magazine – did you already have a background in magazine production or design? Thank you for saying so, we really appreciate your kind words. Katsujinken’s flavor comes from so many different aspects, first of which has got to be that we are not used to seeing such wonderful substance on sword arts in a printed medium. This is an awakening on its own. This magazine and the likes there of has been missing from the sword arts scene for a very long time. Secondly we have a wonderful arts director named Kent Jensen who does a phenomenal job on cover design, Kent has been there since I first announced Katsujinken’s creation and his work is captivating. After that, the articles, layout, and photography are responsible for bringing life to the magazine as a whole. I would go further in attributing the look of our publication to the work of our publisher Donna Quesinberry of DonnaInk.com, Donna has been phenomenal in assisting Katsujinken along its journey, were it not for her the magazine would not exist. To answer your second inquiry, no I did not have a prior experience in magazine production. Everything you are presented with in Katsujinken a Sword Arts Journal has been on a learning curve. We are all getting better at producing this publication, but it is definitely a nurturing ambition. I personally have learned so much since day one and feel this is reward in itself, but the desire to push forward and learn more is always present. Q: Katsujinken means “the Life-Giving Sword” and is a term that comes up often in Japanese martial arts. Obviously, that is your background as well, so most people would assume this is a magazine on Japanese sword arts, yet you’ve made a concerted effort to reach out to students of all traditional weapon arts. What prompted you to branch out into other Asian and Western sword arts? We are attempting to bridge gaps between Eastern and Western Arts. Personally, I attribute some of this to my years spent at the Capital Area Budokai Dojo here in the Washington DC area. We held a yearly event called, “Swordfest.” At this event all types of arts converged and demonstrated their perspectives styles and lineages. Arriving at Swordfest from a Japanese mindset of the arts I always discovered and learned interesting takeaways from the Western styles. This ideal was surely applied in a vice-versa fashion for those practitioners of Western styles. Q: As you’ve worked with students and teachers of these other disciplines, what has been the biggest revelation? The most unexpected? First, let me say that it has been a huge privilege and honor to have gotten to know so many senior Sensei and Instructors of the arts. Not to forget all the other individuals that make training in swords possible for us. The practitioners out there are but only one side of a coin, we need to always remember those that work hard on forging blades and ornamentation, producing armor and period clothing, the wonderful members who run the forums in which much discussion and learning occurs, those that pull events together along with resources, and basically anyone that contributes. There are so many people in our communities that help give life to our training and it is exciting to meet all of them. 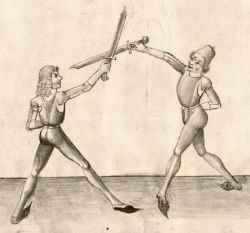 I think I touched on the “biggest revelation” in an earlier question, but definitely the relevance of techniques and teachings across the sword arts. Yes, some techniques are weapon related and sensitive, but a person can gain a lot of understanding from watching other arts. This is true also between the Japanese Arts alone. You can never gain a whole picture by only training in one art, you need to occasionally reach out and verify what you are doing compared to that of others. Example, I used to sit in the dojo early before my Meishiha Mugai Ryu class and watch the Kendo guys and gals run through exercises and varied training techniques. I would then find myself using those same techniques while training on my own. This is a mild example and the whole ideal about viewing and learning from all arts can be very enlightening as a whole. Q: As you come to the end of your first year, what’s been the biggest lesson? I would say that running a magazine is the job of a mad man. It was impossible to understand what was involved in creating a magazine until I was doing it. You have to be prepared to work tirelessly around the clock. There are deadlines to meet, sales charts to keep track of, (customers, advertisers, and article writers to keep happy and enthusiastic), emails to write and questions to answer, not to mention the countless nights where only 3 to 4 hours of sleep are awarded, plus so much more that goes on behind the scenes. It drains you, it can beat you down and make you pull your hair out, but just when you can’t take anymore the printed copies arrive and your heart beat slows a bit and everything becomes euphoric. I love working on this publication and watching it grow. There are so many facets of growth we can pursue with Katsujinken, the sky is the limit for sure. I have no plans on giving up on this venture regardless of how hard things can become. There is a vision here and we all see it, so to reiterate on the biggest lesson learned, I’d say that we need to push through and move forward. We already have a readership of hundreds across the globe, but how cool would it be to grow that readership into the thousands and beyond. Imagine how many untrained practitioners out there are looking for what we do. They are looking for a window into the true arts that we all maintain and love. Lets spread the word. Q: Year two is on the horizon – what can we expect in 2013? Is year two here already? Man where has the time gone? Really though, year one was great, we have our forth volume arriving just in time for this Christmas and next we are working on a Western Arts dedicated edition for early Spring. After that, we’ll probably mix things up again and eventually we’d like to hold a Women of Edged Weaponry edition. There are some wonderful women out there holding there own within all the arts and its inspiring to have them train beside all the men. Not to mention they tend to brighten the scenery, if I can say that. The ladies deserve their due. With 2013, we can expect bigger and better. Lets build our audience up and spread the news. There is a lot going on in the world with swords and edged weaponry, let’s bring it all together in the pages of Katsujinken a Sword Arts Journal.